Next Silicon Valley: Local governments spend way too much effort encouraging tech startups. Local governments spend way too much effort encouraging tech startups. They should encourage other kinds of startups instead. 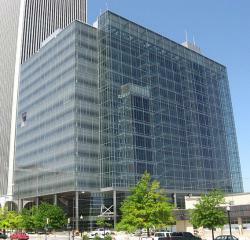 Tulsa City Hall, also known as One Technology Center, in Tulsa, Okla. Visiting downtown Tulsa, Okla. last week, it was impossible not to be struck by the city’s wealth of art deco architecture, a legacy of a pre-World War II oil boom. But near the center of the small downtown is a very modern, glass-and-steel tower that currently serves as, among other things, city hall. The tower was formerly the headquarters of Williams Communications, a 1990s fiber-optic spinoff of Williams, a Tulsa-based natural gas consortium, that wound up vanishing into a series of mergers. The tower, in addition to hosting municipal offices, will soon be home to a publicly owned supercomputer that one local booster told me would hopefully encourage technology startups in the city. It’s an intriguing idea, and certainly I wish Tulsa all the best. But even though the supercomputer concept is unusual as a means, the proposed goal—technology startups, conceived of as somehow involving computers—is lamentable. Not because there’s anything wrong with tech companies, but simply because every city and state in America has the exact same idea. A good long article last week in the Louisville Courier-Journal titled “Shortage of programmers hampers Louisville’s effort to attract tech startups” encapsulated the problem. Everybody wants tech startups, but there are only so many skilled programmers to go around. The striking fact that a quarter of American high-tech startups are founded by immigrants reflects that reality. What’s more, while it would obviously be nice to become the next Silicon Valley, the fact is that Silicon Valley is already where it is. By and large technology talent and technology venture capital are going to gravitate there, or to existing secondary tech hubs in Seattle, Austin, and Boston or at a minimum to places (San Antonio, say) that have close transportation links to them. There’s room for high-tech elsewhere, but if every civic leader in America focuses on this goal simultaneously they’re each going to accomplish very little. It makes more sense to realize that there are small firms with growth potential out there in all kinds of sectors, and state and local officials should look more closely at what assets they already have and what those assets need to thrive. The Kauffmann Foundation recently partnered with Inc. magazine to produce a comprehensive analysis of the geography of fast-growing privately held companies (a good proxy for “startups”) that underscores this point, by examining different sectors of the economy. And in per capita terms, the top-10 list of metro areas for high-growth firms goes way beyond Silicon Valley and Alley. San Francisco is on there at No. 4, with San Jose at No. 7, but the top performer is Washington, D.C. (driven, naturally, by the government-services sector) followed by Salt Lake City. Indianapolis is just ahead of San Jose. So even though high-tech is a disproportionate driver of startups, it’s still a small share of the overall pie. Two of the fastest growing companies on the list are Domino’s and Papa John’s, both innovators in the seemingly prosaic field of pizza delivery. Having a pizzeria in your town is no great achievement, but having the corporate headquarters of a major international brand is. Given the realistic limits to how much high-tech growth your typical city can expect, the smartest move may be to look around at what great small businesses you already have and ask what they need to thrive and grow. So what exactly do they need? Kauffmann’s analysis of the Inc. data found that such conventional measures as local venture capitalist activity, R&D spending by local universities, taxes, and patents per capita didn’t matter. The level of college graduates with degrees in technical subjects, by contrast, makes a difference, as does the overall ratio of new businesses to old ones. Having good local schools and being the kind of pleasant place to live that might attract skilled workers also turns out to be a generally sound growth strategy. The nonsignificance of taxes is itself an interesting finding, since all else being equal people prefer not to pay taxes. The flipside is that taxes finance public services, which may do more to attract firms and workers than taxes do to deter them. The moral of the story, in other words, is that becoming a friendly place for successful startups is mostly about the fundamentals. Startups come in all kinds of sectors, and the biggest driver of startup success is a deep local pool of skilled labor. That means being a great place to launch a business and being a nice place to live are deeply related goals. Good schools, solid infrastructure, appealing cultural amenities, and a reasonable balance between taxes and public services mean more than a supercomputer.